This post is sponsored by ZonePerfect but the content and opinions expressed here are my own. Ok, go ahead and TRY to tell me those don’t look good. That’s what I thought. AND, the part that makes them even better is hidden. You can’t even see the chocolatey goodness that is the Perfectly Simple bars at the bottom of the muffin. Yup. Chocolate. First, let me start by saying that these bars by themselves are really good…but crumble them up and make them in to breakfast muffins with frozen yogurt and they are in a whole new ball game. You know, so I obviously scoured Pinterest looking for some cool way to incorporate granola type bars into a recipe and came up with absolutely nothing. FYI, you should be aware that when you put granola and recipes anywhere near each other on Pinterest you can only find out how to make your OWN granola bars. Well, I eventually started looking at breakfast recipes, since I knew that’s when I would be eating the bars and came across one for froyo muffins. That’s when it clicked…these muffins could really use a base…you know, like cheesecake. It would also be really awesome if that base had chocolate in it and was filled with protein. 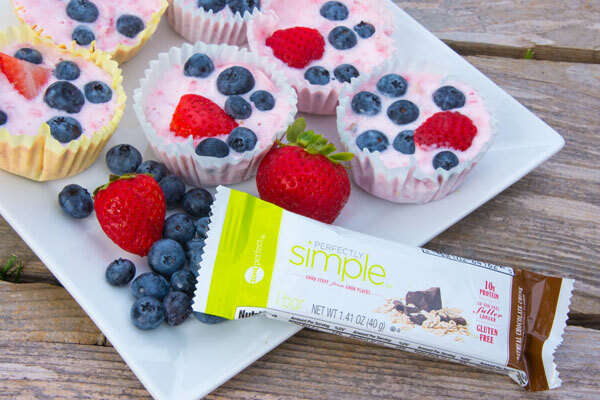 Boom, enter the Perfectly Simple bars. 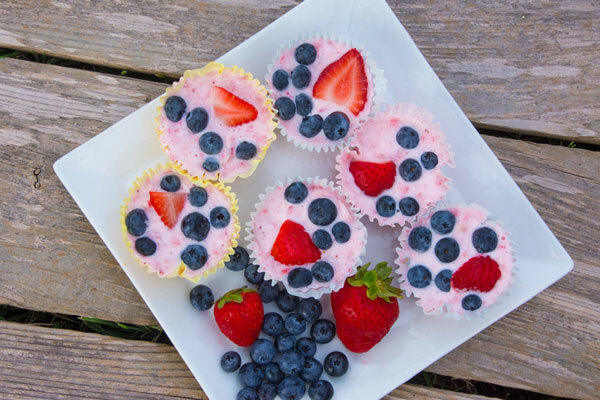 Crumble those babies up, put them at the bottom of the muffin tin, add you yogurt and berries, and freeze. Presto! 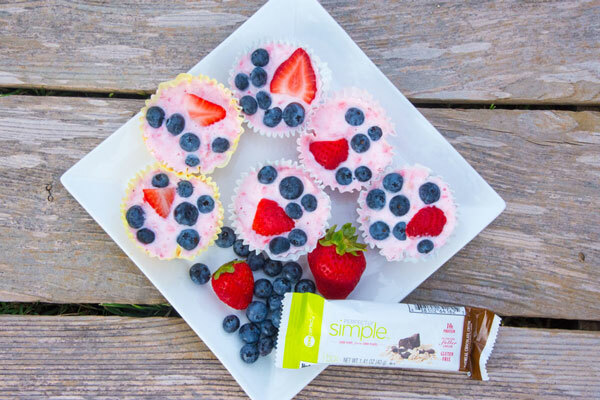 You have an awesome morning snack that will help you get through til lunch. Now, I like to make things a bit healthy around here without quite so much sugar. With there being sugar in the bars, I needed to be extra careful with my other ingredients, so I made my own strawberry yogurt. I basically just took a few strawberries, put them into the food processor, and added them to some plain yogurt. This cuts way back on the sugars in the yogurt. 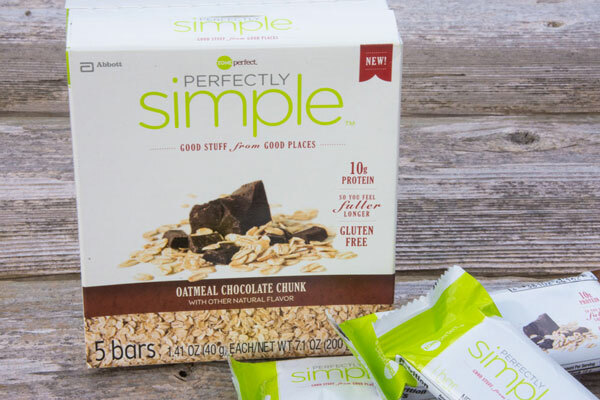 Oh, and there is a coupon available for $1.00 off of Perfectly Simple bars- which I got at my local Target, BTW! Crumble up Perfectly Simple bars. Blend up strawberries in a food processor and add them to plain yogurt. Put in freezer for 2-3 hours or until solid. 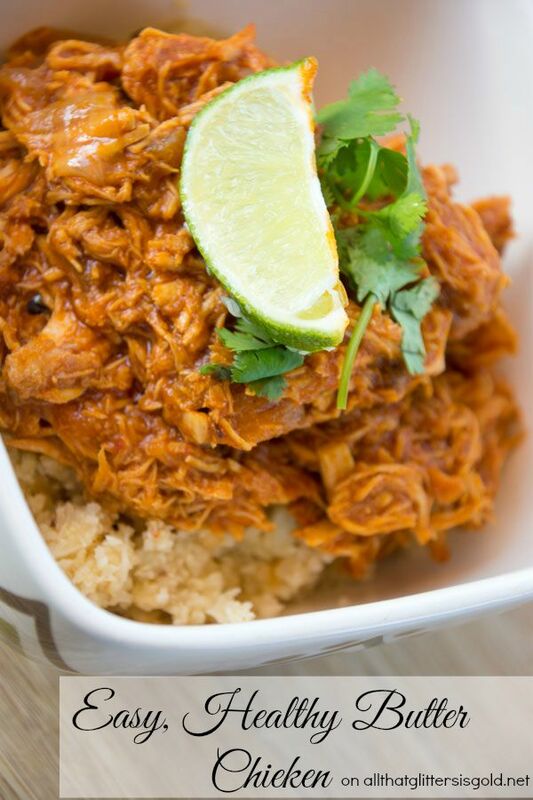 Put your chicken into your crockpot. Mix up your dried spices and add them to the crockpot. Chop up your onions and sprinkle them over the chicken. Add your hot sauce and mix everything together. Make sure that you coat the chicken well and get the spices all mixed in to the sauce. Cut ghee into small pieces and place them evenly throughout the crockpot. 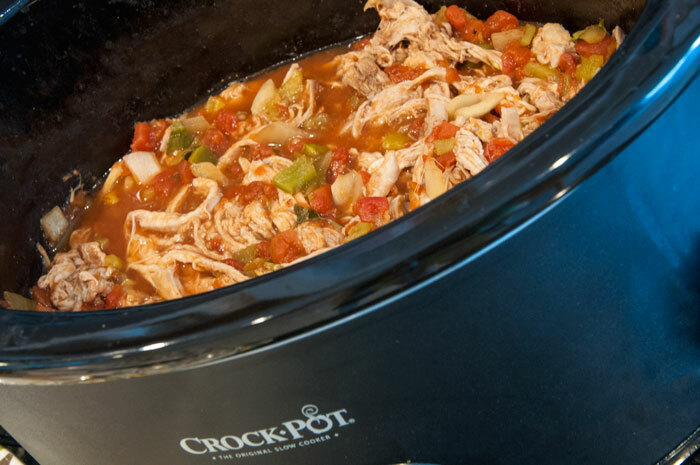 Cook chicken in your crockpot on high for 4 hours or on low for 8 hours. Once it is cooked, take a fork to the chicken and it should shred extremely easily. 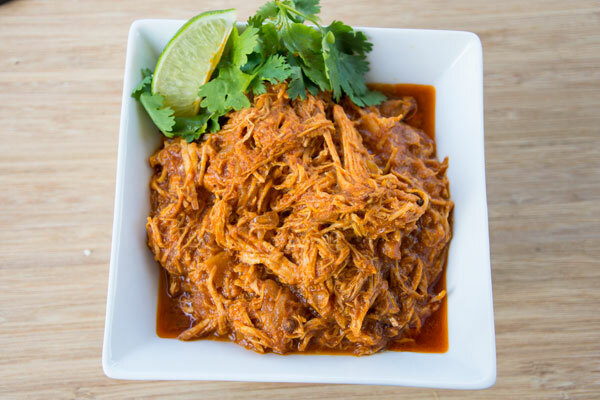 Mix shredded chicken and sauce together. Taste the sauce at this point and decide whether it tastes enough like ranch. This is the point where you would add more dry spices if you want more of a ranch flavor. I personally added a lot here! Cut the tops off of your peppers and take out the seeds. Scoop the chicken mixture into each pepper. 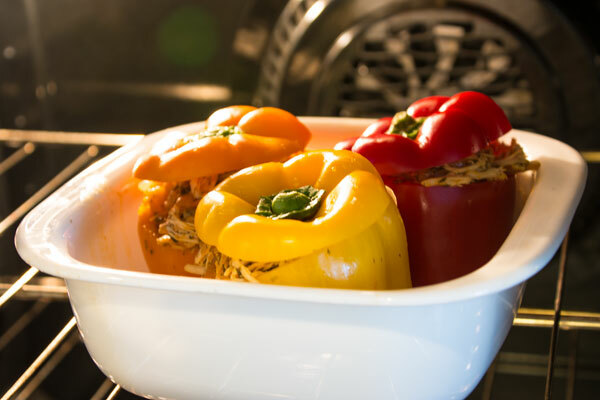 Bake on 350 degrees for 20-30 minutes, or until the peppers are a bit soft. I won’t lie, I would eat the chicken mixture just by itself as well. Ranch chicken=life! I hope you all enjoy the recipe! Let me know if you happen to try it out! Sorry I have been so MIA lately! I have had so much going on and just not enough time for it all. Sometimes you just need to take a little breather in order to get yourself back on track! It’s been nice to have a little break and focus on my shop and my real life. 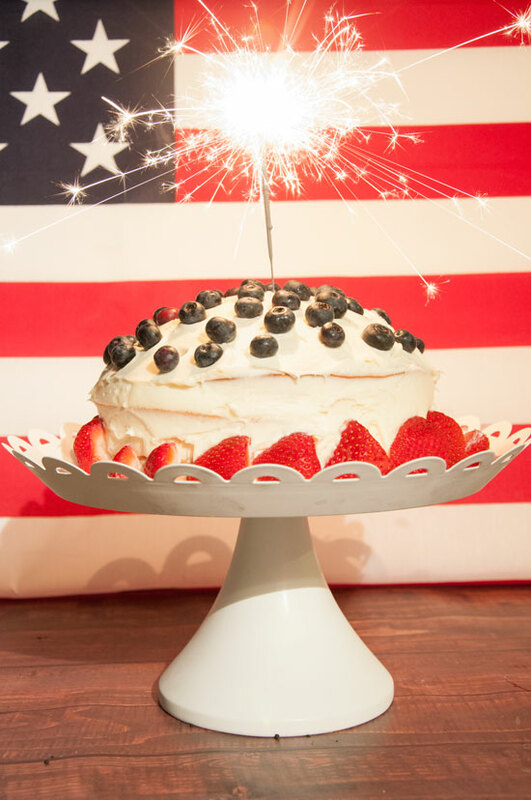 Well, today I’m back and I have a wonderful recipe for you all! As most of you know, I have been trying to eat healthy ever since my Whole30 back in April, so it’s a good and healthy one! 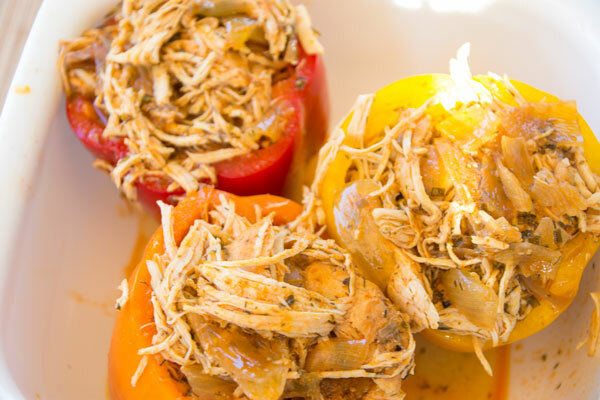 This recipe is not only healthy, but it is SO easy! It’s a crock pot meal, so it’s as easy as throwing something into your pot, setting it on high and going to work. The only work once you get home is to put the meat in to a wrap and add any toppings you would like! I used lettuce as a wrap for my “tacos”, but Wes used a tortilla for his. 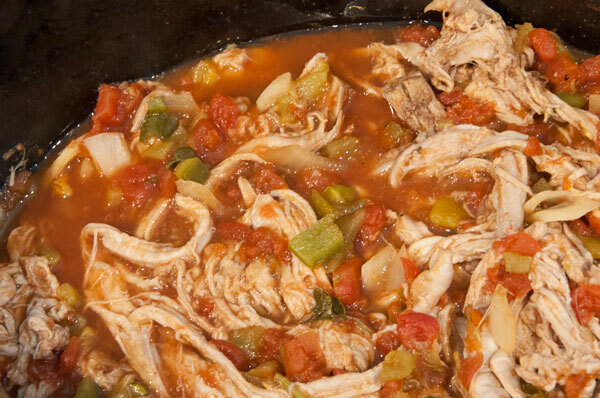 Add pork roast, tomatoes, green chiles, onion, and spices to crock pot. Cook on low for 8 hours or high for 6 hours. Serve in tortillas or lettuce shells! I hope you all enjoy the recipe! Let me know if you happen to try it out! This is so good. No really. So good! My sister found a recipe and made it for her 3 little ones, she told me all about how fantastic it was and how they all devoured it without question. I knew right then that I needed to make it and I am SO glad that I did. It.is.amazing! 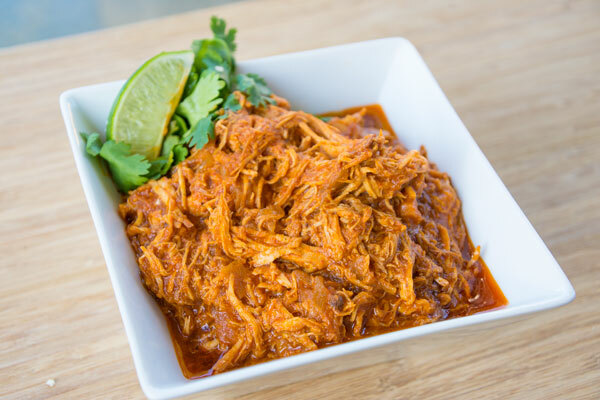 Wash and put your chicken into your crock pot and turn it on. In a saucepan, saute your onion and garlic with the coconut oil until tender. Add your ginger, coriander, cumin, cardamom, cayenne pepper, salt, and pepper. Add tomato paste and coconut milk. Stir and cook until all combined well. Pour sauce over chicken in crock pot. Cook for 4 hours on high heat or 8 hours on low. 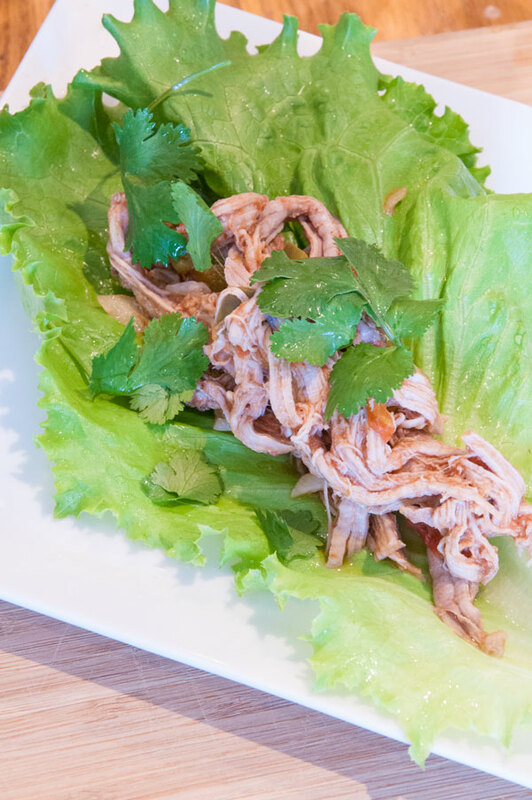 Once on your plate (or in your bowl), squeeze lime over top and sprinkle with cilantro! We made ours with cauliflower rice, but you can put it over regular rice as well. PS: I thought that I would hate cauliflower rice, but it’s actually really good. Once cooked, you can’t even tell that it is cauliflower! Crazy! I’ll be sure to write a post next week on how I made the cauliflower rice and keep y’all updated! 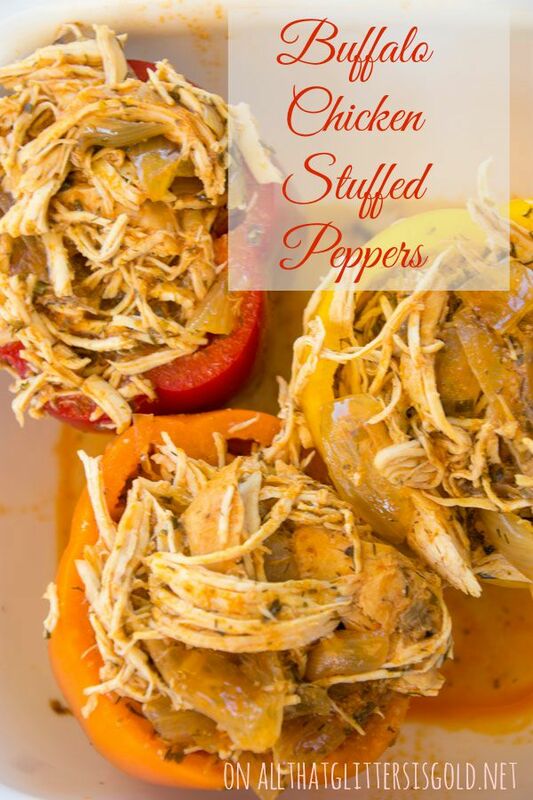 Let me know if you try the recipe and love it! Thanks for stopping by! Come follow along on Intsagram, Twitter, and Facebook for updates and sneak peeks! 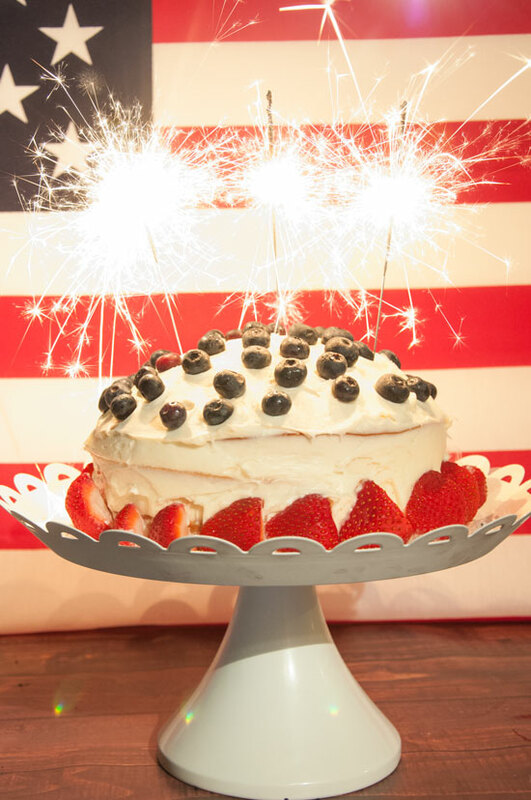 Have fun making your cakes:) Happy weekend before 4th of July! Be safe!